Last week, during a hot and sweaty 6-mile run in Central Park, a very tall man brushed past me, nearly knocking me over. Annoyed, I assessed whether I should say something but kept my mutterings to myself, hoping my evil eye would burn a hole in the back of his sweaty, blonde head. Not more than 30 seconds later, he physically and verbally accosted a woman half my size, prompting her to fight back, to no avail. She fell, landed on her head, was visibly shaken, stunned and bleeding. The man kept running. In typical New York fashion, nobody else stopped to help as my running buddy and I called the police. Turns out, the victim had nothing but her apartment keys on her person. I understand this girl thought she’d be safe in broad daylight (it was 11am). After all, Central Park has seemed so safe all these years: there’s an entire police precinct smack in the middle! However, in recent months, I have noticed a certain amount of aggression all over town, prompting me to call 911 on more than one scary occasion. It turns out, crime in the park has gone up by 44% in 2010, and 2011 isn’t looking much more promising. A cell phone. Be ready to call 911 anytime, anywhere. Enough money for a cab ride home and a bottle of water (and not much more). A metrocard, just in case. If you have it, pepper spray. 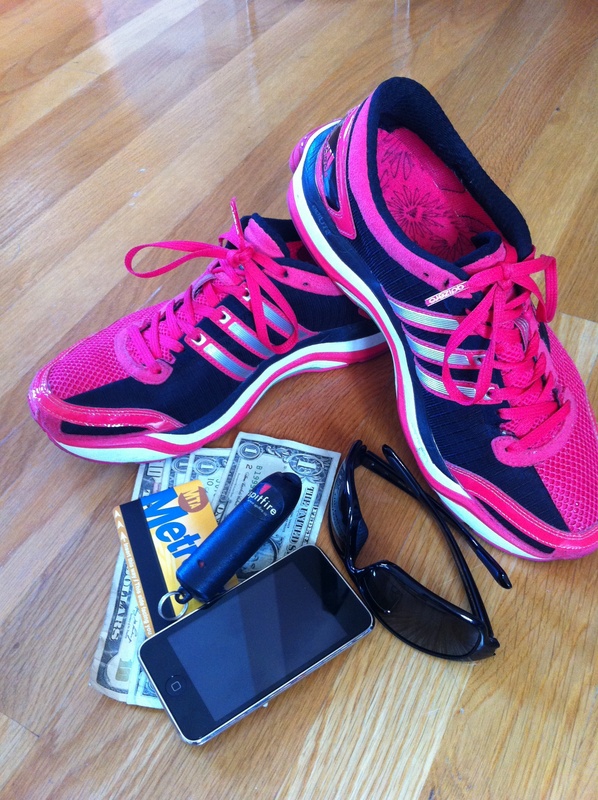 I know it sounds like a lot, but if you have little pockets in your running uniform, these items can be tucked away for emergencies. …and if you’re reading this but don’t live anywhere close to NYC, know that a crime can happen anytime, anywhere, so keep the music on your headset low enough to hear your surroundings and always tell someone where you’re headed. Should something happen, FIGHT BACK. Do not keep quiet. Cause a scene, get loud and take note of every detail. If a serious crime is happening, collect DNA (hair, skin, blood) any way you can and do not stop fighting back.